In the opening minutes of Harry Potter and the Deathly Hallows Part I, it becomes brutally clear this is no longer a children’s story. It has been said that the world has watched Harry Potter and friends grow up before our eyes. I’d disagree. We’ve seen their childhoods destroyed. The innocence in Potter’s eyes that greeted us six films ago is long gone. Magic is no longer cool. It’s deadly. The opening minutes see Harry and his friends, Ron and Hermione, literally saying goodbye to their childhoods and, in some cases, their families. They’re going off to war, uncertain if they’ll ever return. More raw emotion pulsates in the first two minutes of Part I than in any of the other excellent Potter films. The evil Lord Voldemort has ascended from the magic version of purgatory and he’s corrupting souls. Not even the magic world’s trusted ministries are safe from his reach. For the first time in the series’ film history, the action gets gory. The teens who grew up with the series would never have able to view this nine years ago as children. It’s that intense. The movie focuses on a mystery. Voldemort has left pieces of his soul in keepsakes, called horcruxes, scattered across the world. It’s up to Potter and crew to find the horcruxes and, along the way, they must dodge Voldemort’s minions. It appears Voldemort would relish killing Potter more than ruling the universe. We’ve always known that the series would come down to Harry and Voldemort wand to wand. This film is about moving chess pieces across the board. Harry is winning small battles while Voldemort appears to be winning the war. Darkness dominates the film from start to finish. Daniel Radcliffe is so comfortable with the titular role at this point that it’s going to be hard for him to avoid becoming this generation’s Mark Hamill. It’s not a bad thing, though, to be known as the 2000’s version of Luke Skywalker, the ultimate every hero. Just as Harry was destined to be magic’s savior, Radcliffe was born to play Potter. Emma Watson (Hermione) and Rupert Grint (Ron) are equally terrific, giving the film an emotional core. The series has teased a Hermione and Ron union since Harry Potter and the Sorcerer’s Stone nine years ago. Now at world’s end, they’re realizing they can’t live without one another. After the group locates one of the Voldemort’s horocruxes, Ron wears it around his neck and quickly falls into darkness. It exploits all of his fears and insecurities. Grint rises to the occasion, playing the scenes with suitable anguish. It calls to mind the inner turmoil facing Frodo Baggins in The Lord of the Rings series earlier this decade. The supporting adult cast is strong as always. The story plays out like a hybrid of Star Wars/Lord of the Rings and finally, after seven films, the Potter series can stand toe to toe with them in terms of emotional resonance and action. The film’s tagline states “Nowhere is safe.” No one is safe either. The characters we’ve come to care about are laying their lives on the line. They’re saying goodbye as we prepare to say our own ‘so long’ to the film series. No end to this movie would be satisfying. 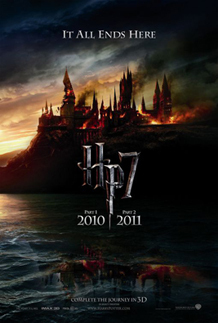 Part II of Deathly Hallows is still eight months away from being released in theaters. When it concludes, so will the Harry Potter saga. Like Star Wars’ The Empire Strikes Back, the bad guys appear to have the upper hand as a conclusion is tantalizingly close, but still so far away. If Part I’s exhausting emotional journey is any indication of what’s ahead, there won’t be a dry eye in the house come July 2011. To read Matt Palmer’s story about the local impact of Harry Potter, CLICK HERE.